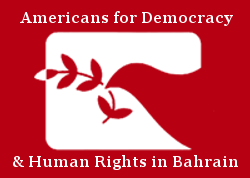 Americans for Democracy and Human Rights and Bahrain (ADHRB) and the Bahrain Institute for Rights and Democracy (BIRD) welcome the decision by the UK High Court to lift the immunity from Bahrain’s Prince Nasser Bin Hamad Al Khalifa for prosecution against torture allegations. 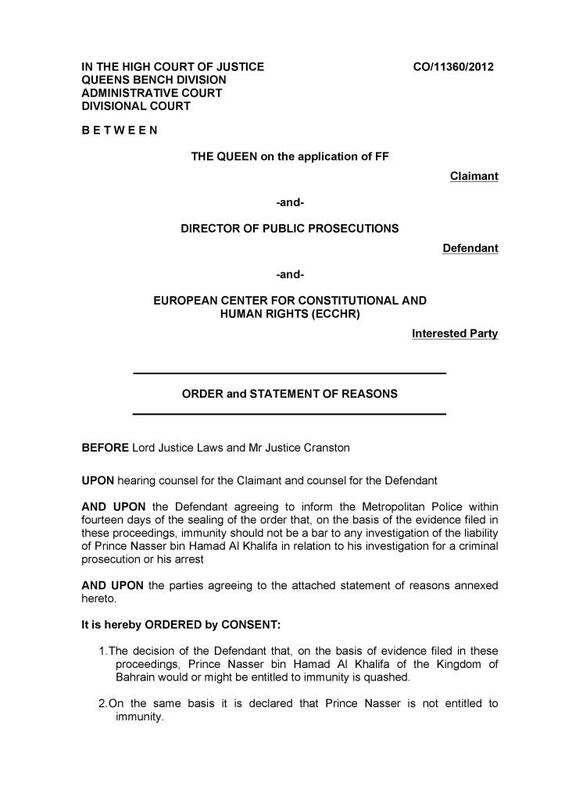 The ruling came after the High Court quashed the previous decision made by the Director of Public Prosecutions that Nasser could not be prosecuted in the UK for alleged torture under Section 20 of the State Immunity Act 1978 over his role as Head of the Bahrain Royal Guard and position as member of the ruling family. The decision was made by two judges with the consent of the DPP after she accepted the wrongful decision to block prosecution. Nasser is accused of severely torturing members of Bahrain’s opposition during the outbreak of pro-democracy protests in the Kingdom in 2011. A former torture victim under the name “FF” who has received asylum in the UK brought the case against Nasser in the UK. The UK has received strong criticism for maintaining relations with Bahrain despite the Kingdoms horrific human rights record. Nasser became a regular visitor to the UK recently attending the 2014 Royal Windsor Horse Show with members of the British Royal Family and also attended the 2012 Olympics. “This decision is a victory to every victim of torture in Bahrain and will send a strong message to perpetrators of this crime that they will be held responsible” said Abdulla. ADHRB and BIRD commend the decision by the UK High Court which is an important step towards the recognition of human rights in Bahrain and accountability for grave violations of these rights. Prince Nasser bin Hamad Al-Khalifa is the son of the King of Bahrain and a regular visitor to the UK where he attended Sandhurst and has met Prince Charles. His three children were born in the UK and he is well-known on the European endurance horse ride competitions circuit. As chair of the Bahrain’s Olympic Committee, he represented Bahrain at the opening ceremony of the London 2012 Olympics. At that time, the ECCHR and the Bahrain Center for Human Rights (BCHR) called on the British foreign office to block the Prince’s entry into the country for the London Olympic Games. The organizations wrote to the Prime Minister and Foreign Secretary William Hague asking for the withdrawal of the Prince‘s Olympics visitor’s visa. They sent a detailed dossier summarizing publicly available information, including witness statements from Bahraini opposition members, about allegations of torture. They asked for action to be taken. They put the Crown Prosecution Service and the War Crimes Team of the London Metropolitan Police, SO15, on notice of the dossier. FF, a Bahraini refugee in the UK, who had himself been detained and tortured, took up the case and instructed Deighton Pierce Glynn solicitors to write to the CPS asking for the Prince to be arrested and prosecuted while he was here for the Olympics. The CPS replied stating that the Prince had immunity from arrest and prosecution. FF applied for a judicial review of the DPP’s decision on 26 October 2012. The client is anonymized as FF to protect his family from possible reprisals and a strict anonymity order was made at the outset of the case. In February 2011, a pro-democracy movement in Bahrain rallied for more participation in the political process in Manama and other cities of Bahrain. The protests were brutally stopped by Bahraini security forces, but are nevertheless still on-going. On 15 March 2011, the King of Bahrain declared a state of emergency and a first wave of repressive actions by government’s forces took place. At this time, two oppositional leaders of Bahrain, when detained in the Manama Fort prison clinic Al-Qala’a (seat of the Ministry of Interior), alleged being flogged, beaten and kicked by the son of the King, Nasser bin Hamad. Both opposition leaders were sentenced to longtime imprisonment. Amnesty International and other groups recognize them as prisoners of conscience. A national investigation team set up of international experts, the Bahraini Independent Commission of Inquiry (BICI), published its report in November 2011, detailing torture allegations against government security personnel and recommending investigations. To date, an investigation of the aforementioned allegations of the two prisoners of conscience against Nasser bin Hamad have not been initiated or at least not been publically reported about. Meanwhile, Nasser bin Hamad travels frequently to the UK and a number of other European states, without facing investigations by local prosecution services.